A card game about designing propaganda out of news for both sides of a war. Balance each country war support, wellfare and productivity threading segments of news into propaganda posters. Featuring a fully animated set of cards by Maralba Alcaide and a completely adaptive soundtrack by Fran Romger. 1) You get 5 cards each turn. 2) Divided them into 2 sets, one for each country. 3) Each card has a title, a body image and a text. Drag the card into the selected slot, and then send it to the side you want. 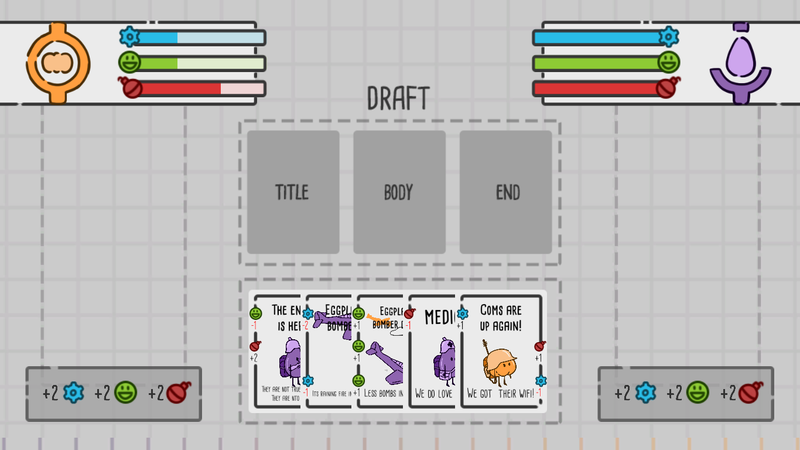 4) Once all your cards are assigned into two posters, press build. Each poster will have different effects into that country's citizens. Created in 48h for the Familiar Game Jam X. The theme was "two points of view". Master of shaders, the card effect is flawless and the overall art and music style too. Maybe a better card disposition would be nice improving to see the values at first. The Good: The game is awesome, I needed a bit to notice how it worked (which I think it's good in a game, to get the feeling of it by yourself) but when I got it, it's just great, how it manages the theme and the art is pretty cool as well. The music just fits it pretty well. Also, the EXTRA EXTRA sounds are just lol haha. Complex to do and complete game for a jam. The Bad: game gets bugged sometimes when you break the flow of how it's supposed to be handled (drag card to center, push one side button), but I can see that programming wise, this game has A LOT of work, and it's been made in 2 days so I guess it's very normal. 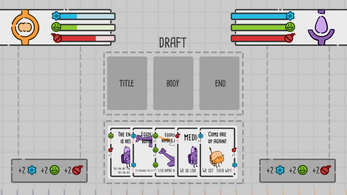 Virtual card games always offer something different in a game jam! Simple and fun idea with great art and audio implementation.